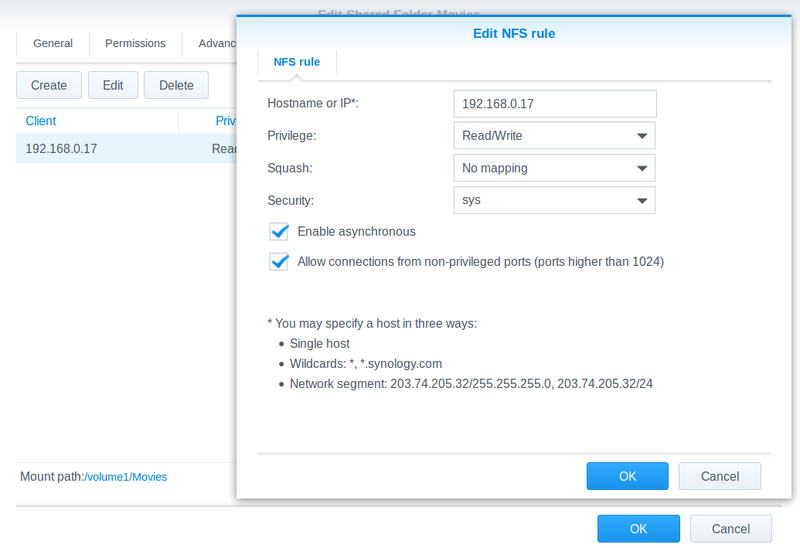 I would like to mount a NFS folder share from my Synology NAS on my RPi. So far, all my efforts have been unsucessful. I think the issue is related with uid and gud but I don't know how to match it on client. Thanks for all advices and possibles solutions. The error might mean you can't mount it locally, even though it says server. Everything looks to be set up fine on the Synology. You might just want to allow everybody on your LAN to access that share for now. In IP add this. Just to make sure restart it after changing settings on NFS. I am not sure what the security tab does in synology but if you can view /etc/exports on the synology there should be an entry similar to this. This really shouldn't be that complicated, you might just be looking at the wrong place. I hope this solves your issue. 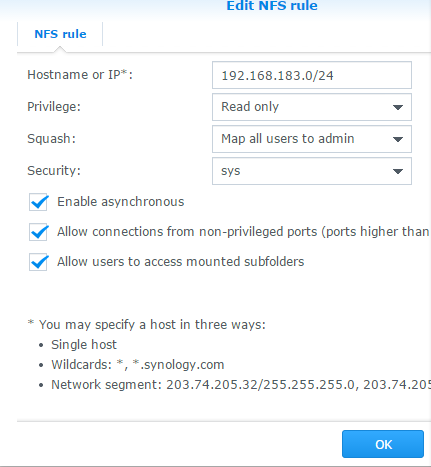 For Synology DSM 5.1, Set Privilege to "Read only" (unless you want your pi to write files) and Squash to "Map all users to admin"
Don't forget to open the firewall ports for this (the list of built-in application rules has one for Mac/Linux file server that does the trick). Not the answer you're looking for? Browse other questions tagged raspbian permissions nfs or ask your own question.